Sinclair, America's biggest owner of local TV stations, is about to get even bigger. On Monday morning the company agreed to buy Tribune Media for $43.50 per share, valuing the deal at $3.9 billion. Sinclair will also assume about $2.7 billion in net debt, according to the joint announcement. Tribune operates dozens of TV stations across the country. It also has a cable channel, WGN America; a 32% stake in the CareerBuilder web site; and a 31% stake in the Food Network. The acquisition is subject to regulatory approval, but the Trump administration's FCC has signaled its openness to media consolidation. "This acquisition will create a leading media platform that includes our country's largest markets and will further our commitment to connecting people with content everywhere," Sinclair CEO Chris Ripley said in an email to employees. "This is a pivotal time for broadcast, and we are excited to reach more communities across the United States, as well as better serve our consumers and advertisers with new technologies that will super charge our capabilities," Ripley said. 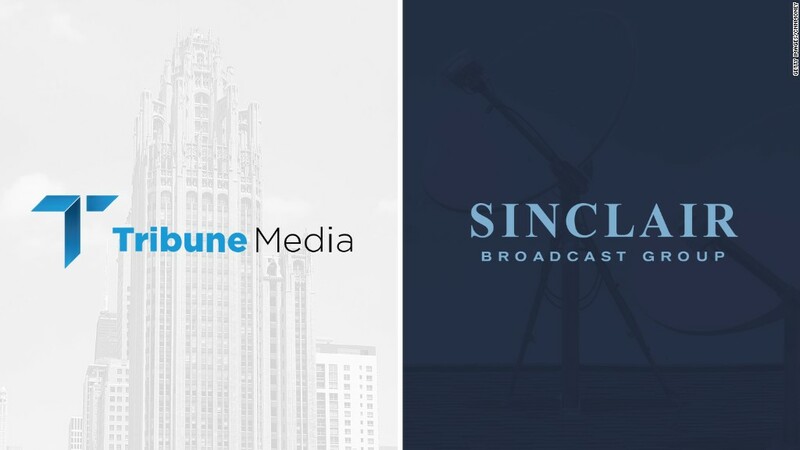 Sinclair beat out another local station ownership group, Nexstar, in the Tribune auction process. 21st Century Fox and Blackstone Group explored a joint bid, partly to block Sinclair's move, but Fox ultimately didn't make a bid, according to sources familiar with the matter. Craig Aaron, the head of Free Press, an anti-consolidation nonprofit, said his group has objections to the deal. "It's a scandal," Aaron said. "Trump-favoring mega-chain gets rules changed -- and expects others to be erased -- so it can put its cookie-cutter newscasts in nearly 70 percent of local markets across the country." Aaron added: "I feel terrible for the local journalists who will be forced to set aside their news judgment to air Trump administration talking points and reactionary commentaries from headquarters. This deal would have been DOA in any other admin, but the Trump FCC isn't just approving it; they're practically arranging it."